This recipe comes from one of Grandma’s sisters, and it’s a little bit different. I’m putting it under the usual headings, but I’m also putting it under the Retro Oddities heading because of one special ingredient. Ice cream. You heard me. Weird, but it works. Oh man, does it work. These Carmel Rolls are perfect for the holiday weekend – perfect if you’re the host or hostess and perfect if you’re the guest. 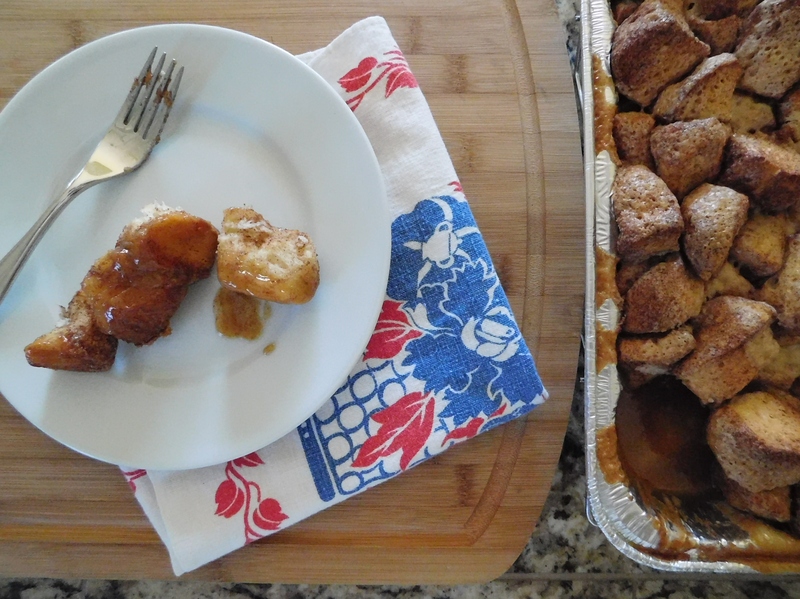 They seem to be a forerunner of monkey bread where there are small pieces of dough covered in caramel and cinnamon/sugar goodness that everyone can pull apart and enjoy together. These are so good that there might be some issues with snitching of each others’ rolls. Kids would love to help make AND eat these rolls. I have to believe they won’t last long. These rolls are so good! Cut each biscuit into 4 pieces (I used “Pillsbury Grands” biscuits and cut them into 6 because they are larger biscuits). 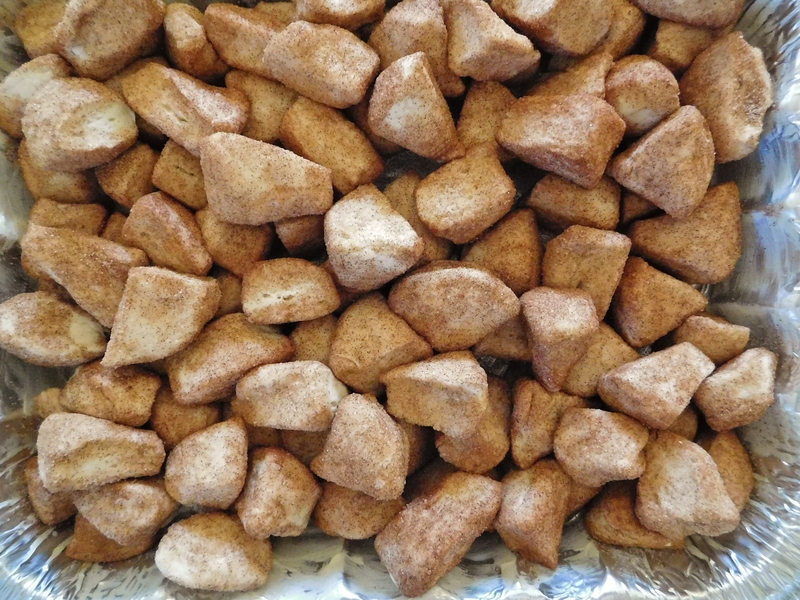 Roll each biscuit piece in a cinnamon/sugar mixture and put into a buttered 9″ x 13″ baking pan (for cinnamon/sugar mixture I used 9 spoons of sugar and 3 spoons of cinnamon – it really doesn’t have to be an exact measurement). Melt (do not boil) and pour over top of dough pieces. It doesn’t say to do this, but next time I would flip these rolls onto a baking sheet for serving. Then the caramel would run down into the rolls more. 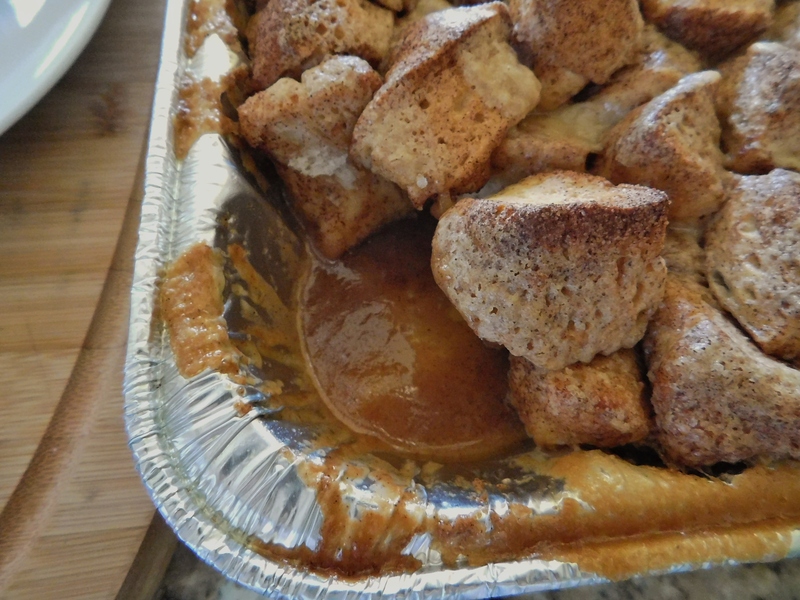 I took this pan to a friend’s house, we just scooped out the rolls and the caramel was puddled in the bottom of the pan. 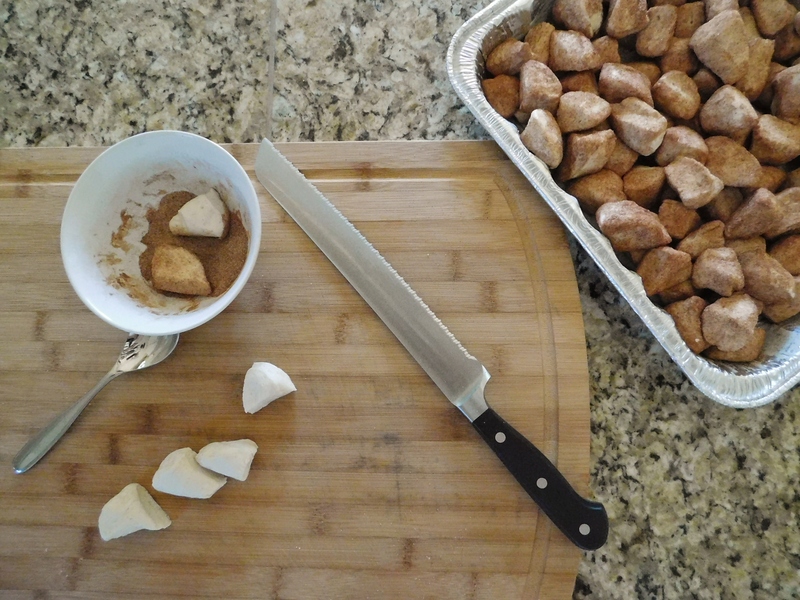 Cutting the biscuits into pieces is really easy and so is rolling them in the cinnamon/sugar mixture. These are, overall, REALLY easy to make. 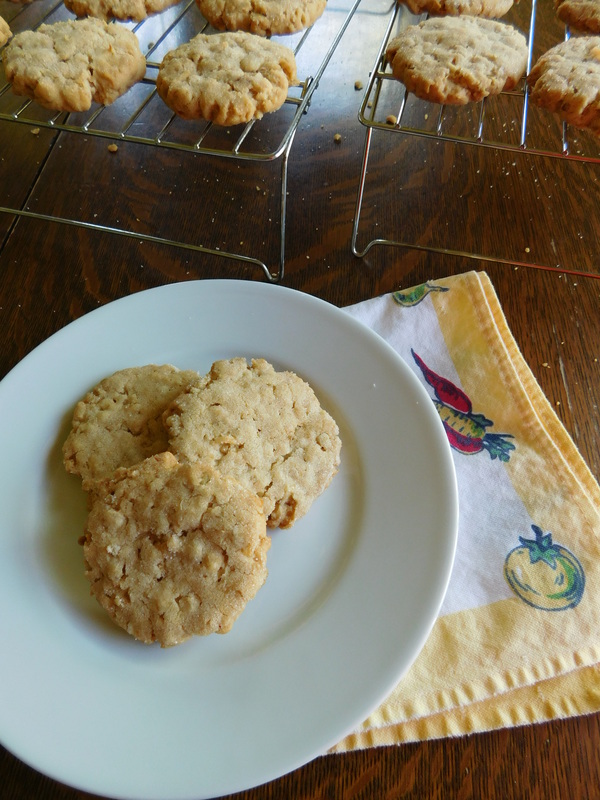 I used a foil pan that was smaller than a 9″ x 13″ pan so I didn’t use as many biscuits – 2 tubes instead of the 3 I bought to use in this recipe. 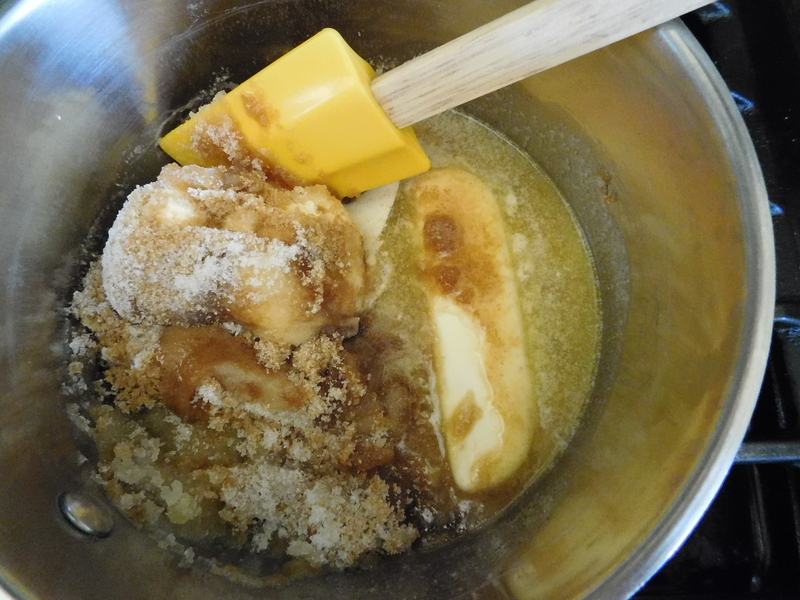 It is a bit unusual to use ice cream in a recipe for caramel. I’ve never heard that one before, but look what a pretty caramel it made! 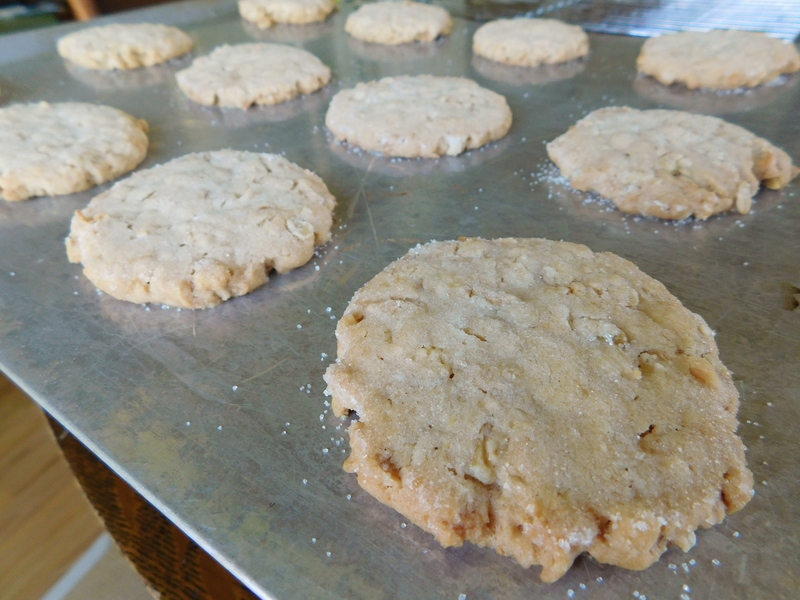 If the pan had been a regular 9″ x 13″ pan, it would have been a bit taller and I could have put more biscuit pieces in. There was plenty of caramel when poured over the top. The rolls come out of the oven golden and crusty and smelling divine! They aren’t the regular shape of a caramel roll, but who cares?! 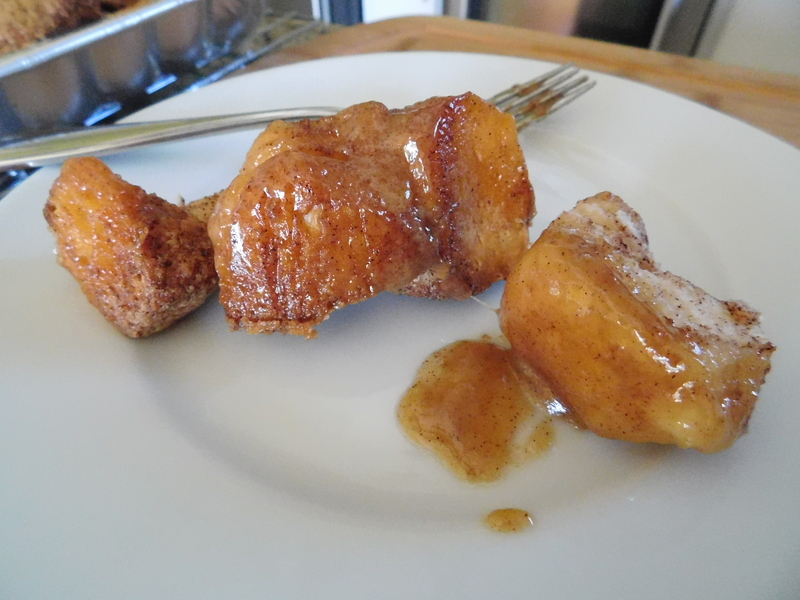 This is the shape they’re supposed to be, and they taste just like caramel rolls – ice cream and all! 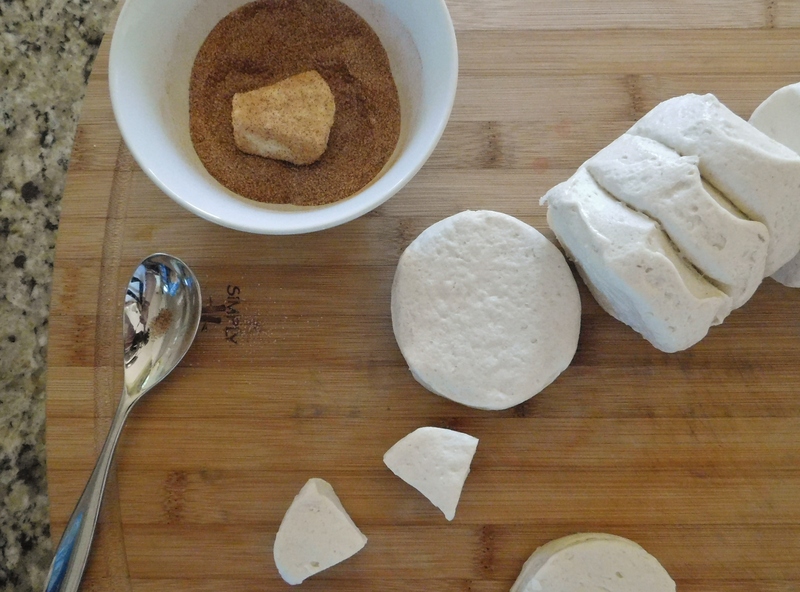 These are so much fun to make – kids would like helping with this recipe! Yes – these rolls are a little quirky and a little unique, but they are perfect for this upcoming weekend. 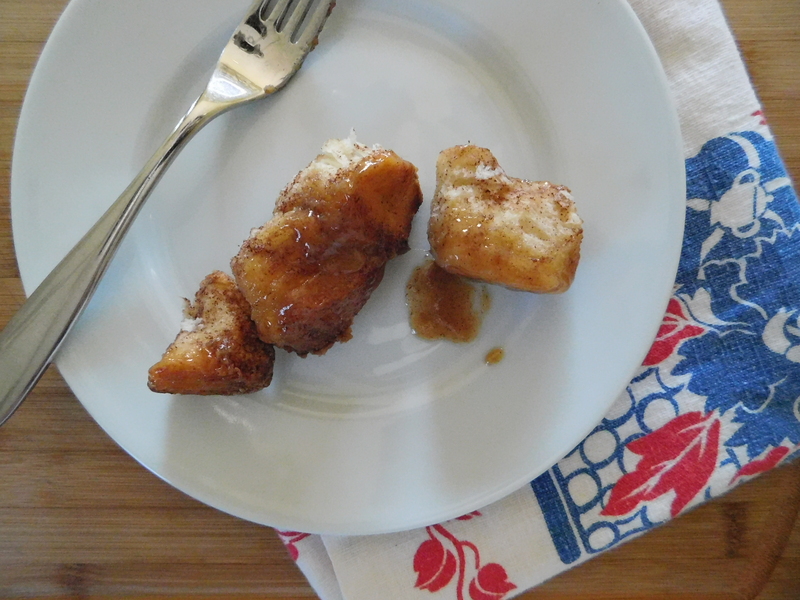 So sticky, so sweet, so good, so ridiculously easy to make! 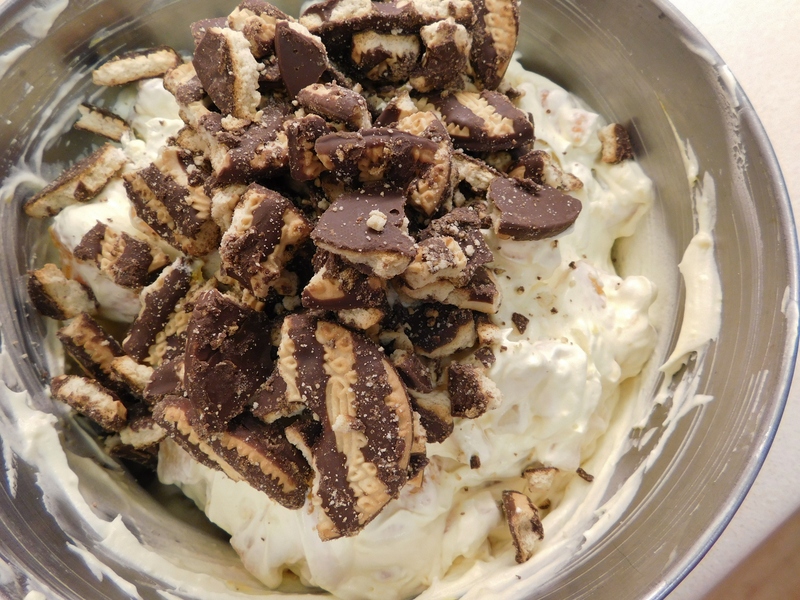 Make a batch to bring or serve at your weekend gathering. Better yet, make two pans – they will NOT last long! Just bake them, flip them, and let the fun begin! Dig in, everyone! Ah, summer. There is only one thing that means summer to me. Swimming. We moved to our house on the lake the summer I was 8 and it was the weekend of the moon landing. Grandma and Grandpa had come to help us move and get settled in, and we took a break to watch it on our scratchy black and white TV. 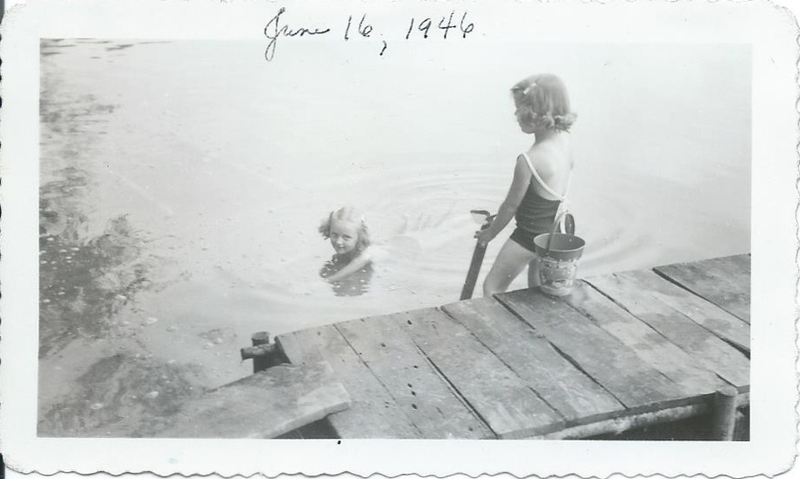 I know that both sets of grandparents were worried about us and the water, but little did they know, my sister and I were water babies and we would never come OUT of the water in the summer. This photo of me was taken before we moved to the lake (before my sister was born, even) and you can see that I was already a water baby! Yep – never out of the water. I still have problems with my ears in cold weather from the constant swimmers ear I had from those days. I’m totally not kidding – we were NEVER out of the water in the summer! We’d only come out of the water to run up the 78 iron steps to the house for the bathroom or to eat, eating fast so we could get back down to the lake and swim until dark. If ever there was proof that you don’t have to wait an hour after eating to swim – we were it! We swam on sunny days, we swam on cloudy and cool days, we swam in the rain, we swam in the dark. My sister and I just loved the water so much! Summer is also the perfect time for salads, and by salads I don’t always necessarily mean salads that have veggies or Jello or even pasta. This Best Ever Chicken Salad is a bit different. 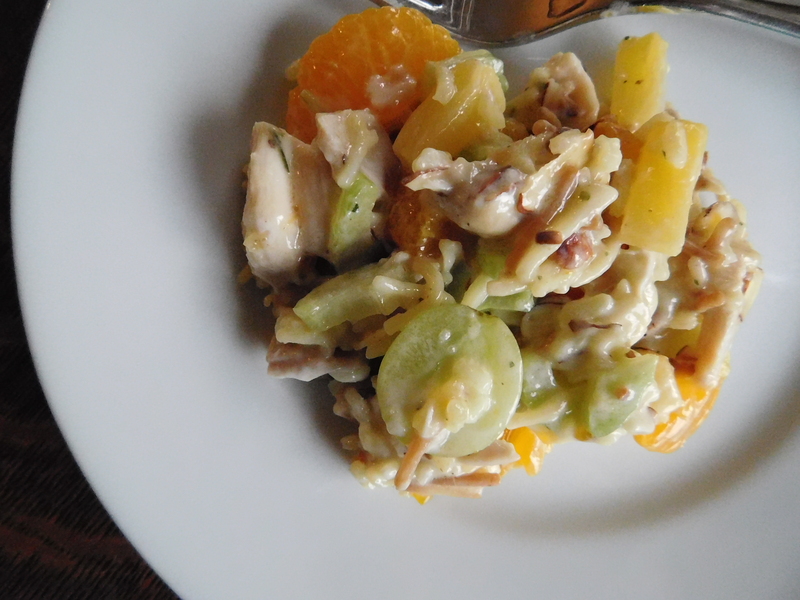 It has chicken and fruit and Rice-O-Roni. It comes from one of my sisters-in-law who made it for us years ago and it’s become one of our family’s summertime favorites. We make it several times each summer and it’s really good. Really, really good. Addictively good. And that’s all I have to say about that. 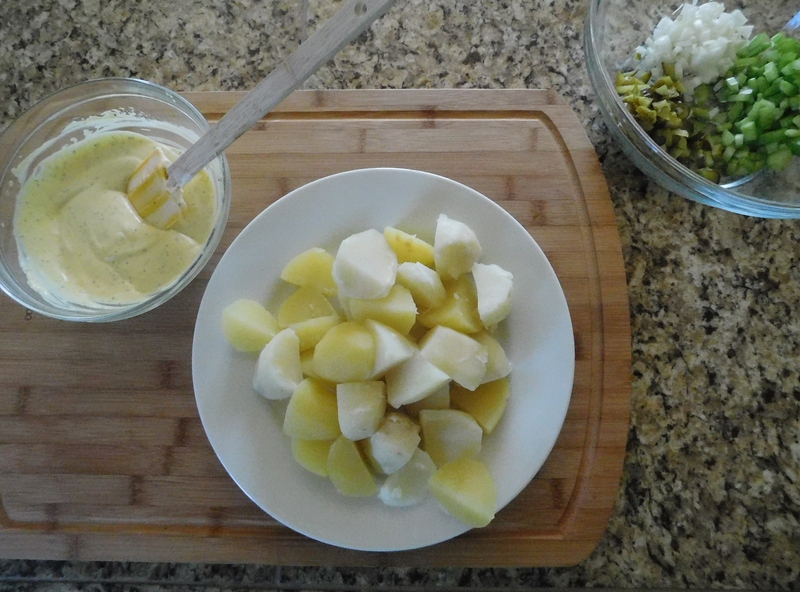 Let stand while preparing the rest of the ingredients. Add chicken mixture and gently toss. This recipe has quite a few ingredients and does take a little time, but it’s so worth it – trust me! 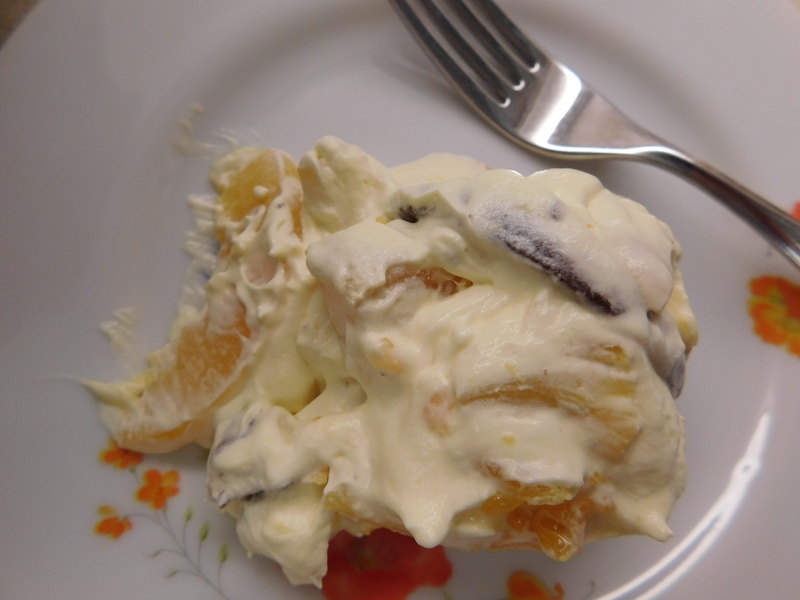 My oldest daughter has become quite famous among her friends with this recipe. She has requests to make it for every big event: birthdays, wedding showers, baby showers, Saturdays. You’re going to want this recipe in your summer salad rotation. It’s so unusual and so amazingly delicious. 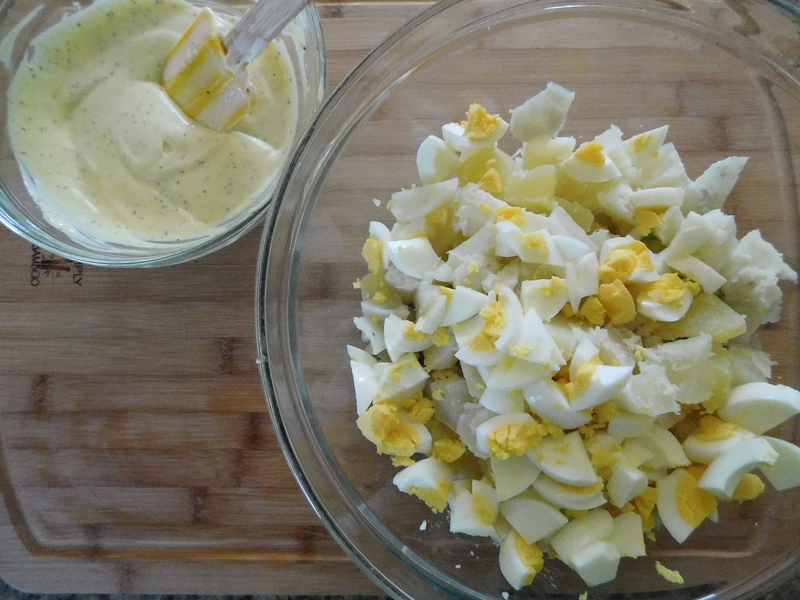 This salad is just the best – the best ever! 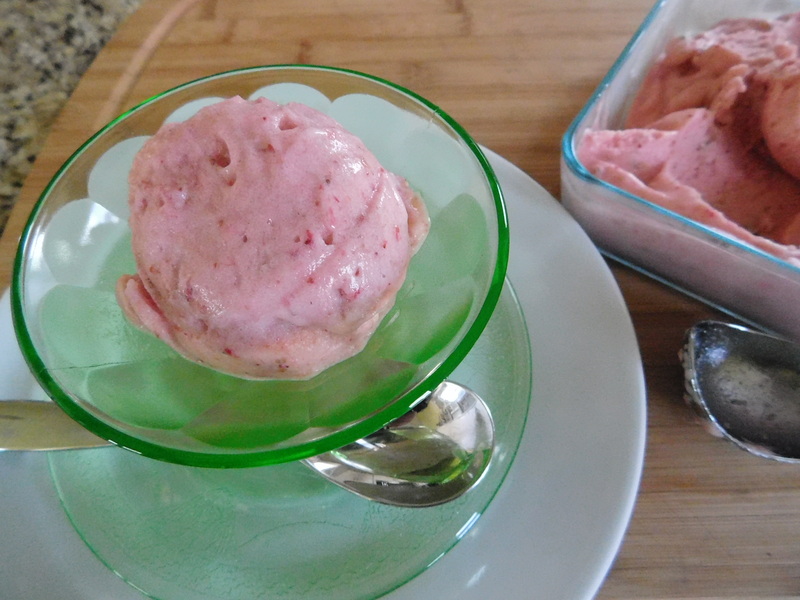 You make this Strawberry-Banana Ice Cream with two ingredients, that’s it. 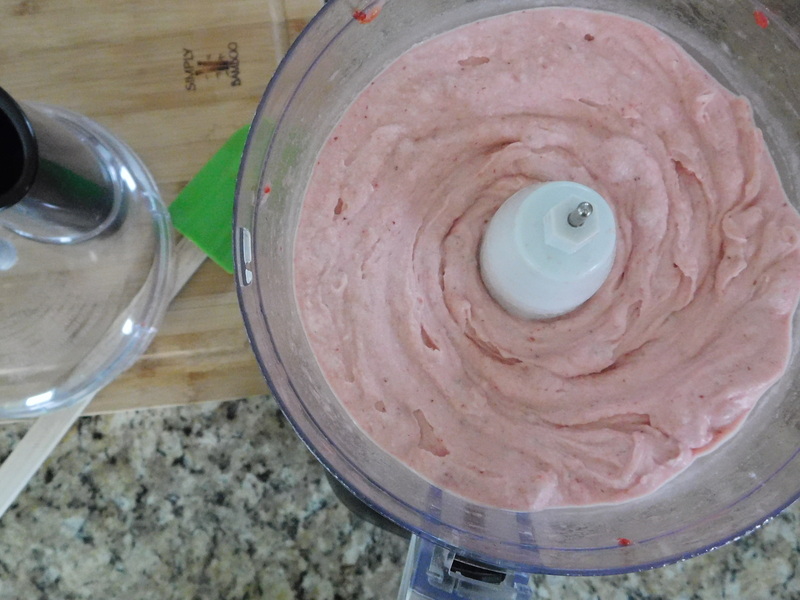 Frozen strawberries and frozen bananas. When you end up with those bananas that get to the point of not great for eating anymore, just peel them, cut them into chunks, and put them in the freezer. They will turn brown if left in there too long, so use them up as quickly as you can. Not that I have experience with that or anything. I mean, I did finally figure out what those black blobs in the zip top bag were. I guess maybe they had been in there a bit too long. 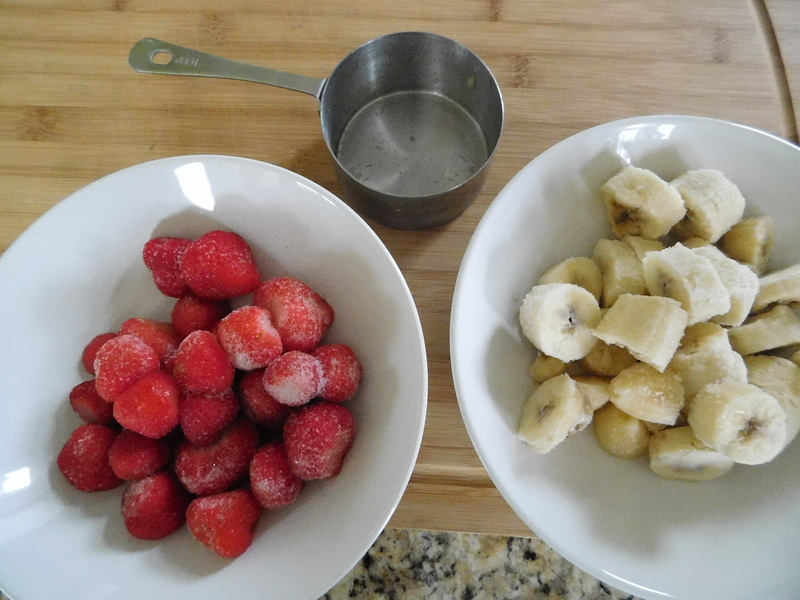 I usually cut or break the bananas into 3 or 4 pieces before putting them into a zip top freezer bag and putting them into the freezer for smoothies or ice cream. I guess it might be a good idea to label the bag so you know what’s in there in future. There really isn’t much of a recipe for this. 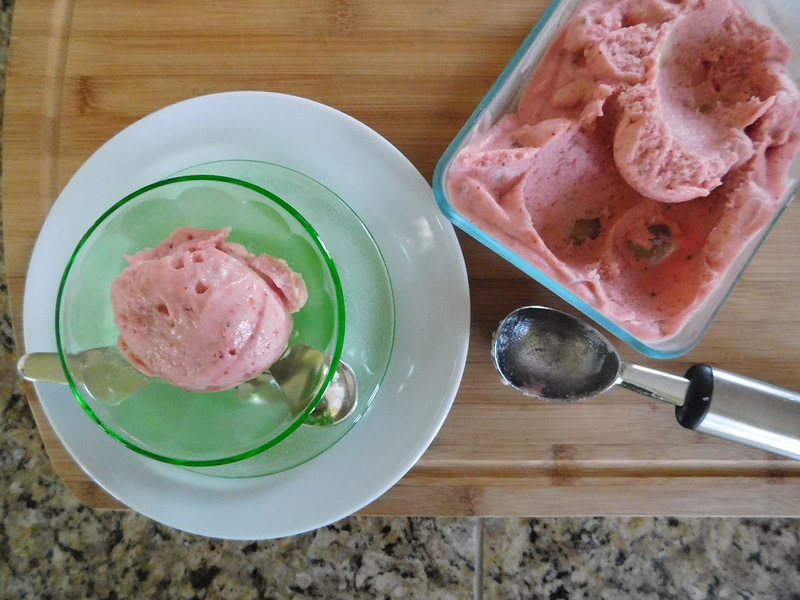 I used the pretty little local strawberries for this ice cream. They all go into the food processor. I give them a few pulses, just to get things going, then let it go until the mixture is smooth. You can eat it right away and there it is – soft serve! Or you can put it into the freezer for a couple of hours to firm it up more. When leaving it in the freezer for a longer period, I let it sit out for about 10-15 minutes before trying to scoop it. 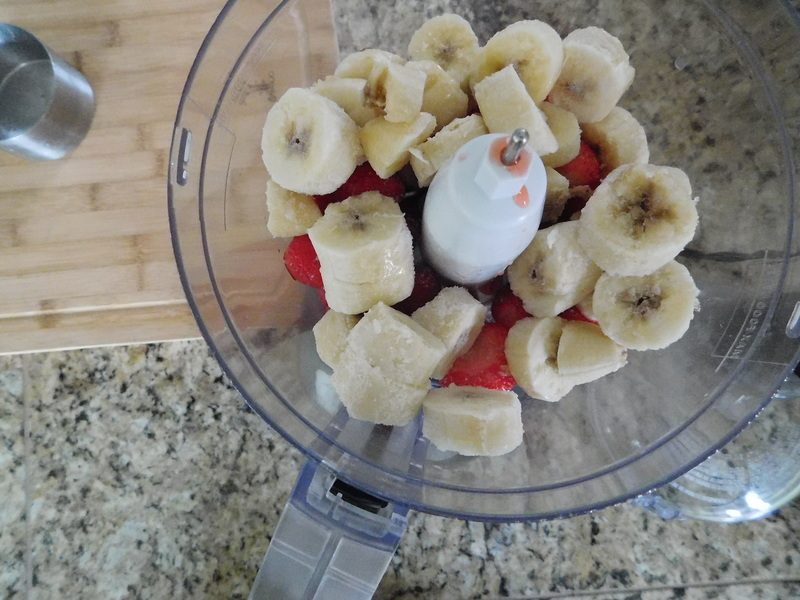 I’ve also tried this with raspberries and bananas, bananas and cocoa, and just bananas. It’s so good and good for you! Just pure fruit and nothing else. The perfect summertime treat! Here’s a photo of my dad the year he became my dad. He’s a Matt Damon/Glen Campbell look-alike!! Only he’s much more handsome than either of those guys!! 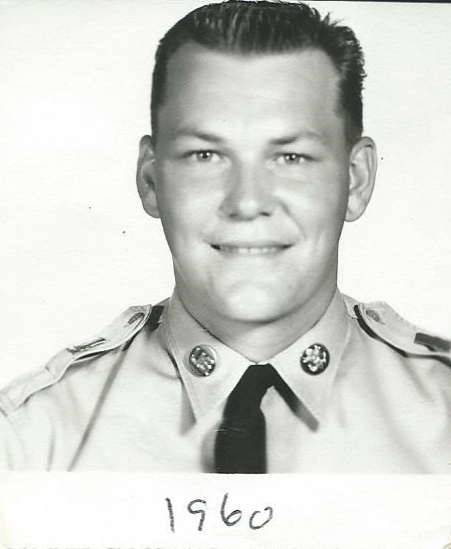 I think this was when he first enlisted in the army. Nobody ever looked better in a crew cut! He had to leave us at age 49 after battling a brain tumor. I miss him every day. The recipe for today comes from my other grandma. I remember her making these cookies when I was in junior high. I got the recipe from her, and I’ve been making them ever since. 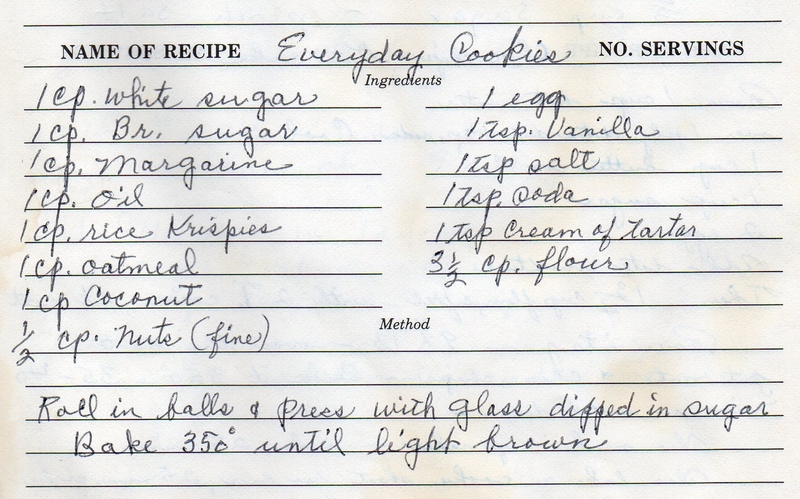 I’m not sure why they’re called Everyday Cookies unless it’s because the ingredients are all things that you would more than likely have on hand so you could make them every day. I also like that this recipe makes a large batch, and you can make these and they would last awhile. That’s why these are a good summertime cookie. 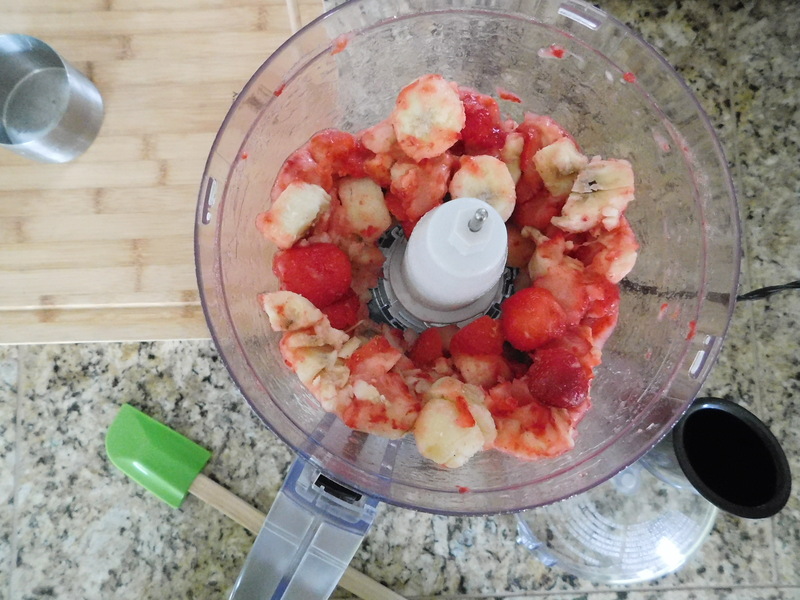 Make them once and put some in the freezer, then take them out again later when you need more of them. Which will probably be the next day. I mean, it’s all good in theory to put some of them in the freezer, but it won’t take long and you’ll be heading back to your freezer for the rest of them. I promise. You will. Just you wait and see! Roll in balls and press with a glass dipped in sugar (I roll one ball, then wipe the bottom of the glass with my hand so the sugar will stick to the glass). You will find that you need to dip the glass in sugar for each cookie. Bake at 350 degrees until light brown, about 12-15 minutes. I used my trusty scoop to make these all about the same size, and yes, I would have gotten even more of them if I had just made them without the scoop. The scoop definitely makes them bigger. My boys don’t mind it when I use the scoop. The cookies come out golden brown and absolutely delicious! They have a crispy, sugary crust on the outside and they just melt in your mouth! 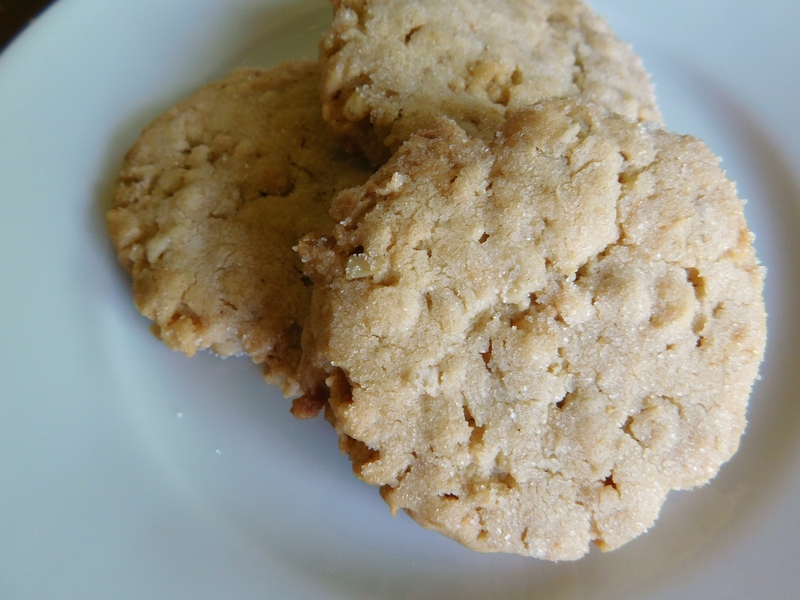 This cookie is ridiculously good, and are so great with afternoon coffee or tea. It’s good with morning coffee or tea, and it’s also good with evening coffee or tea. These cookies are just plain good, any time you eat them. 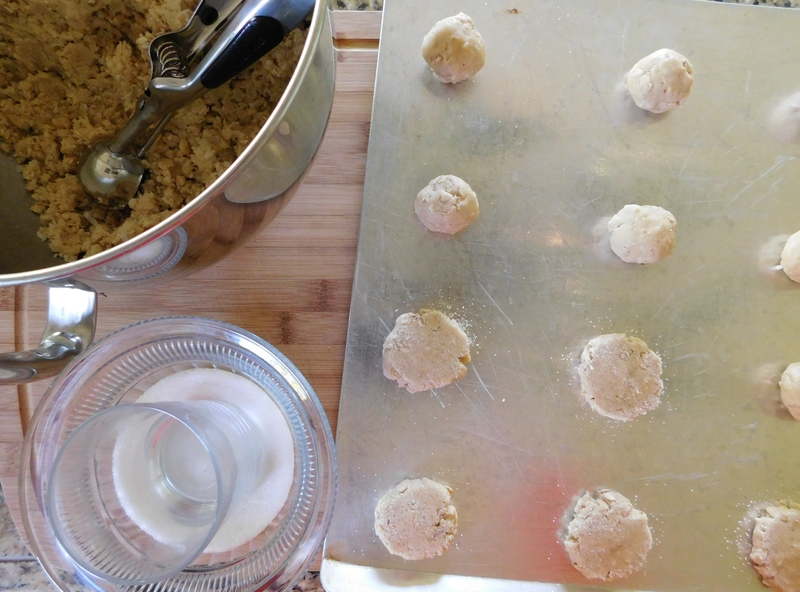 Make a big batch of these delicious cookies and make summer baking easy on yourself. 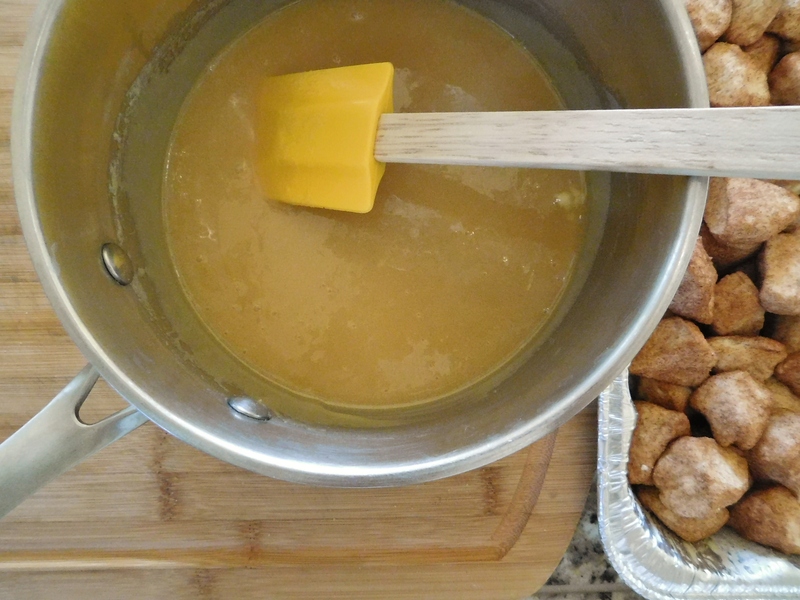 It’s a good thing this recipe does make a big batch, because you WILL want more of them, and because your family will want more of them, too! Just so you know, I DID put half of these in the freezer and guess what? They’ve disappeared. I told my husband and he said, “you’ll have to make more!” Um – who should make more? I say the person who sneaked all the cookies out of the freezer should be the one to make more. I’m still waiting . . . The recipe for today is another one that everyone has and everyone makes. 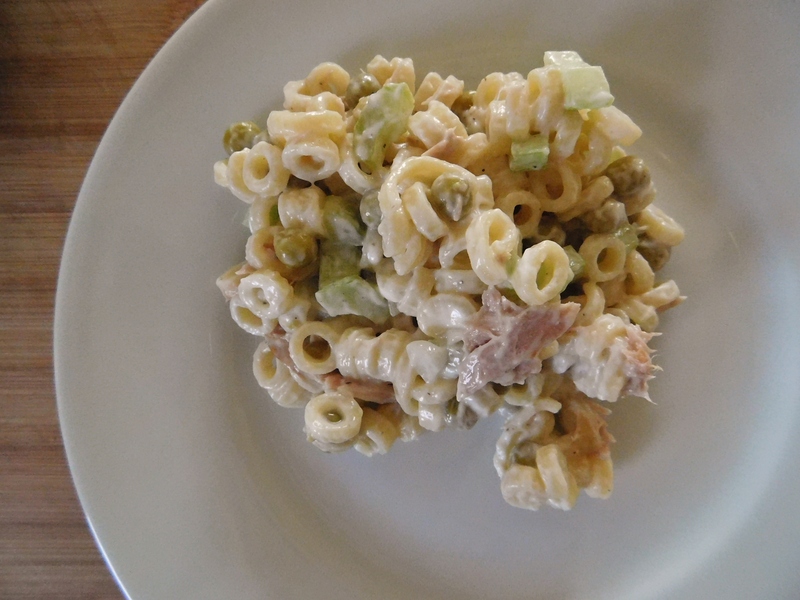 I had to share this recipe for Tuna Salad because, as you can see on the recipe below, my mom started making this in 1960. I guess she liked it, because she made it 3 times that summer! 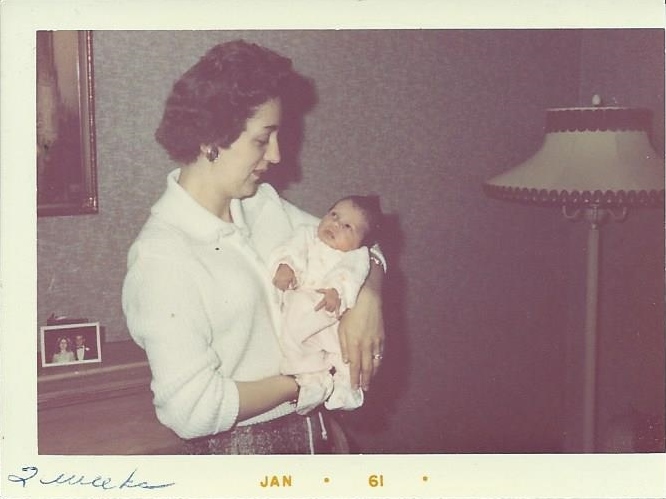 This is how long she’s been making this salad – since the summer before this photo was taken when I was 2 weeks old. I decided to come into the world a month early, so I was a tiny baby, and I’m looking at her with a look that says “are we really gonna do this?” Ha! This was when my dad was in the Army stationed in Turkey and how appropriate (probably staged) that right behind my mom is a photo from their wedding! Love it! I’m sure mom was honing her cooking skills for when he was done with that stint and back home with us. 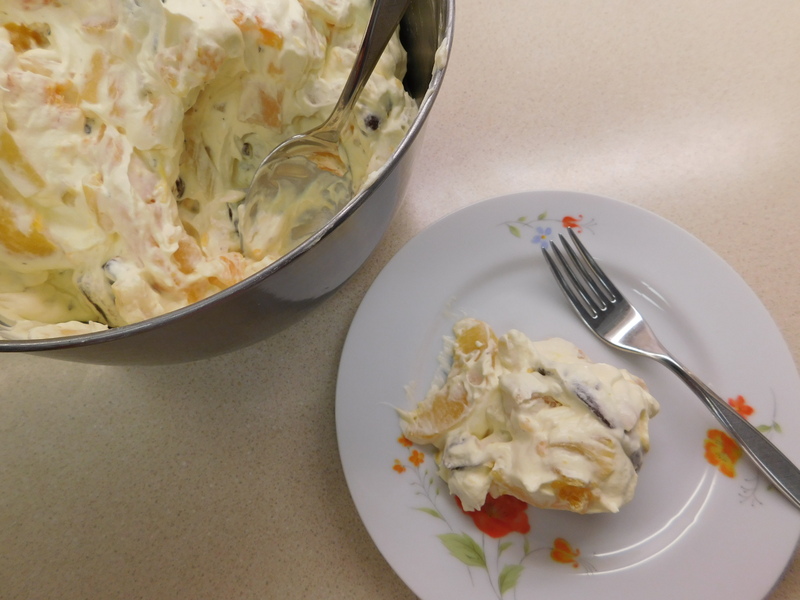 This is another great recipe from an old church cookbook called the New Mixing Bowl. 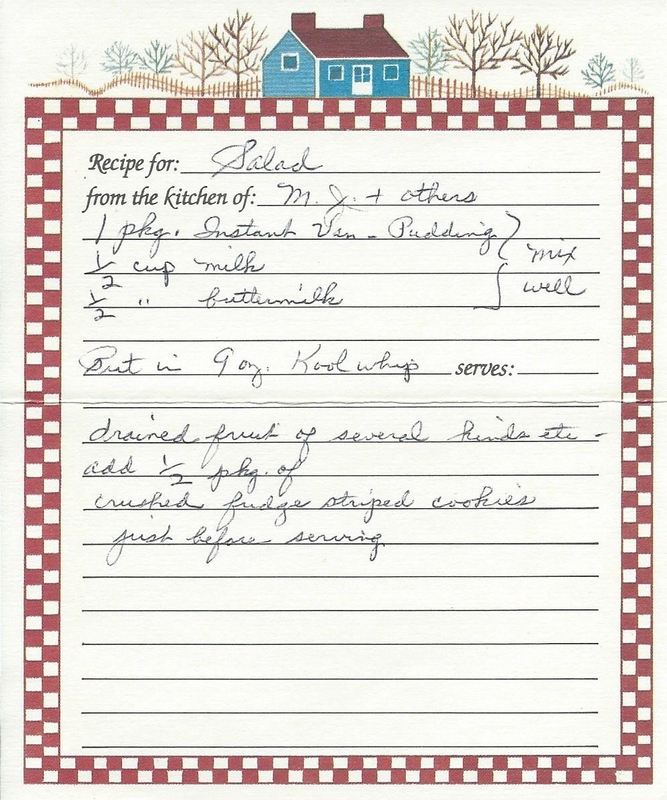 I have found so many family recipes in that book, that I’m sure Grandma had this particular cookbook, too! I’ve said this a hundred times, but I so feel that those old church cookbooks are the absolute best. They’re always a collection of everybody’s best, favorite, and most requested recipes. I just love that, and I can say that I have never made a recipe from a church cookbook that wasn’t just great. I do have a problem with the fact that this says that it serves 6 to 8 people. Ha! Not in our family. 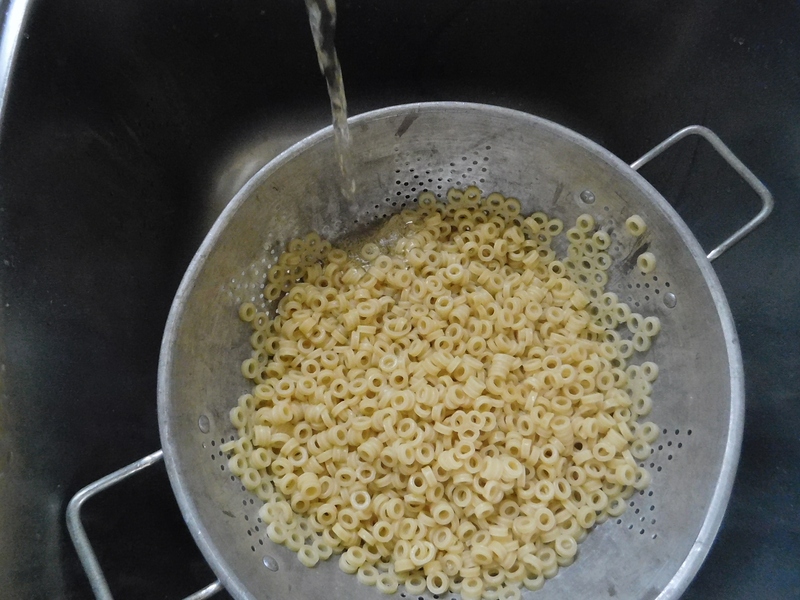 1 pound package of macaroni rings or small shells, cooked according to package instructions. 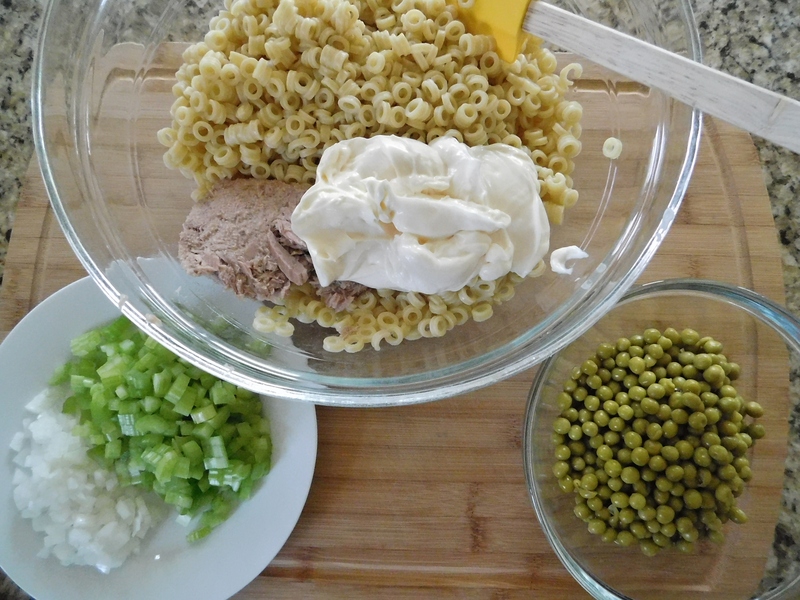 Add cooked macaroni rings or shells and mix thoroughly. 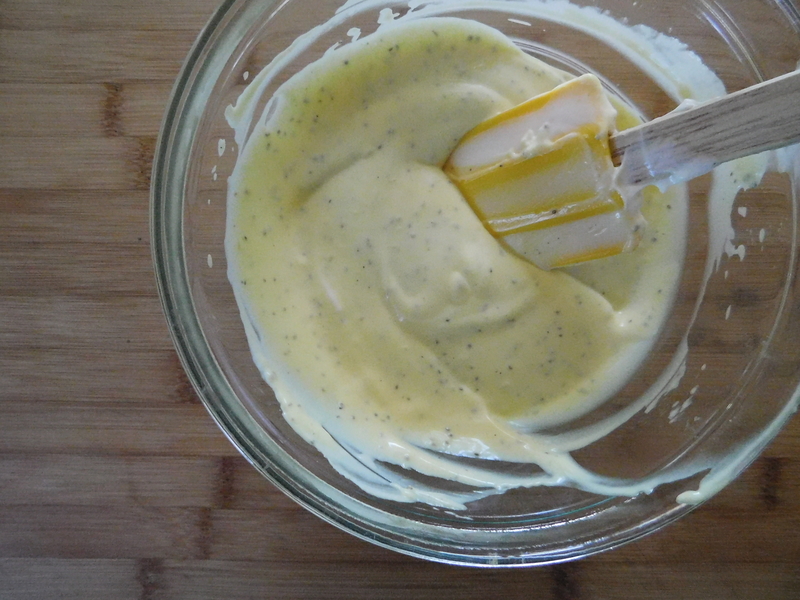 Season with salt and pepper and add salad dressing (I used about 1 cup +/- another 1/2 cup). I used the rings asked for in this recipe, but I normally use small shells. I also usually use frozen peas instead of canned peas, but that’s just a personal preference on my part. This really is so ridiculously easy. I’m not a fish girl, and I have to admit that sometimes I can’t eat tuna. It just depends on the day. Sometimes it’s ok and sometimes it’s not. It was ok on this day! My mom and grandma have been making this for my entire life. 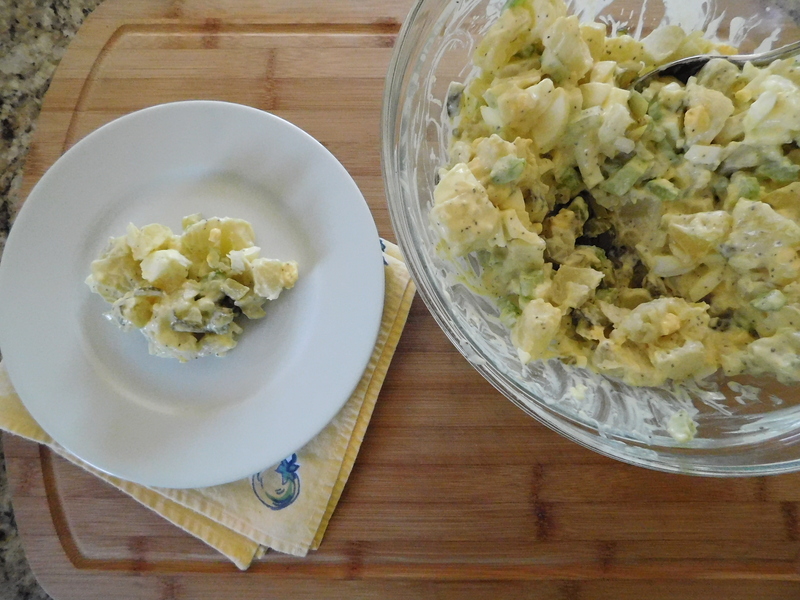 One bite and my first thought was – “Aww – tastes like summer!” I wonder how many batches of Tuna Salad were eaten on our deck or at the farm when me and my sister were growing up. Too many to count, that’s for sure. 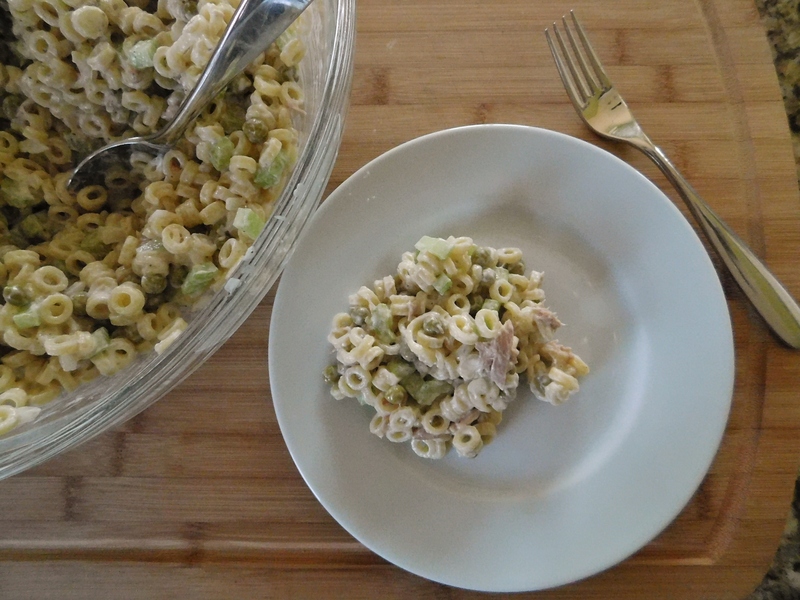 I know that every family – and mom and grandma – has their own way of making tuna salad. 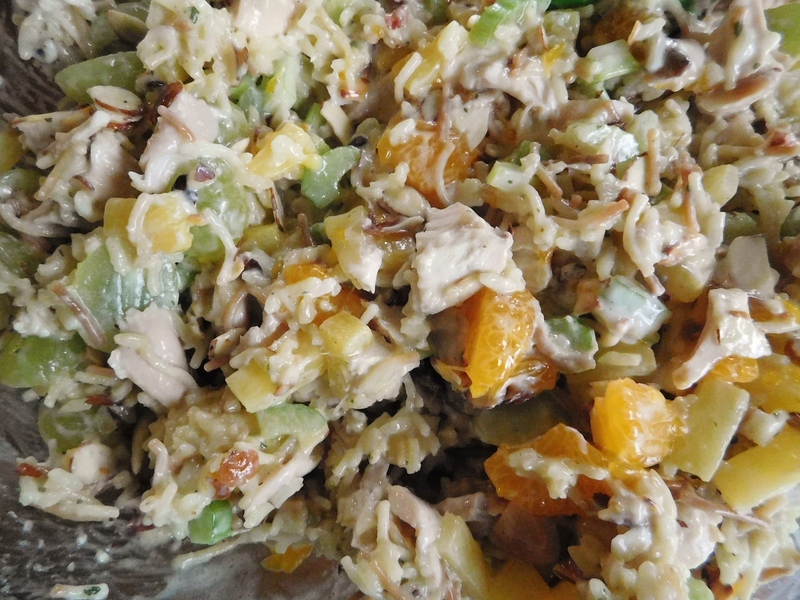 Do you have any interesting tuna salad additions you’d like to share? Please feel free to leave a comment below! 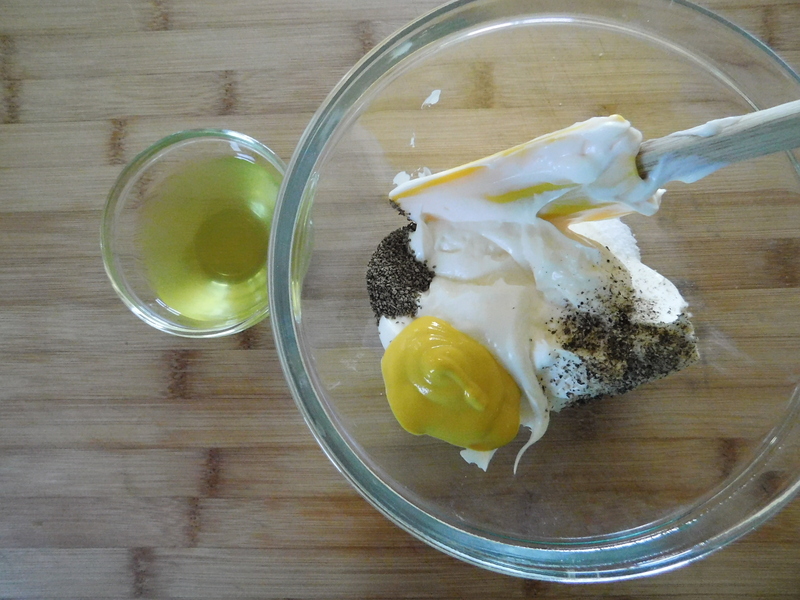 The recipe for today is another one that’s simply called Salad, so henceforth, this recipe will be called Salad #5. As I’ve said before, there are so many recipes simply called Salad, that we have to number them or there would be no way to differentiate. This really should be a dessert instead of a salad. The ingredients in this “salad” are not incredibly healthy, or what you’d think of as a “salad”. You’ll see what I mean as we go along. 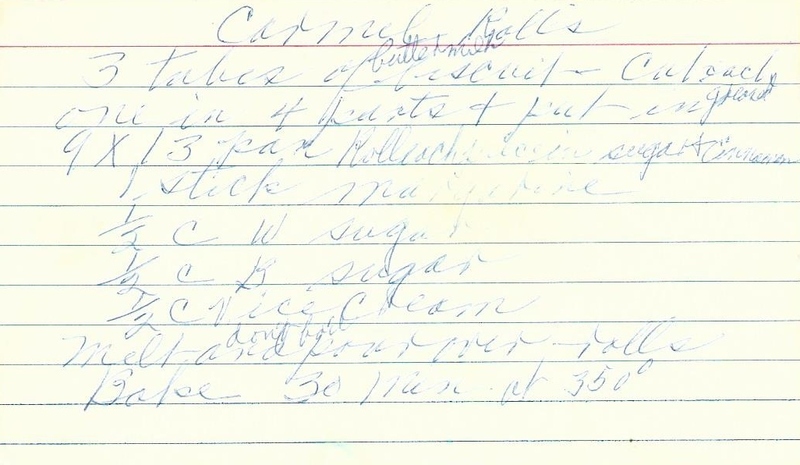 Grandma and her sisters definitely had quite a sweet tooth. 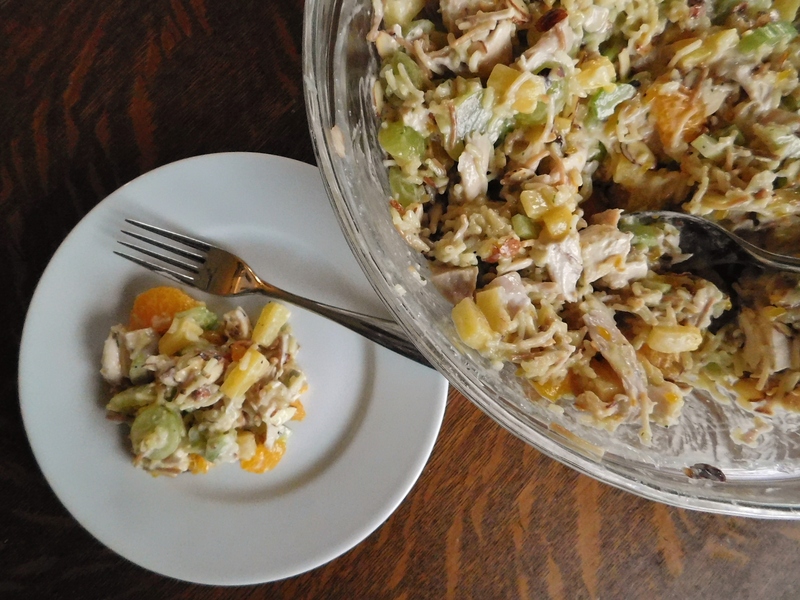 This salad is another really easy, really good one for all of your summer gatherings – graduations, bridal showers, picnics, or potlucks. Yeah – I’d say this is more of a dessert. 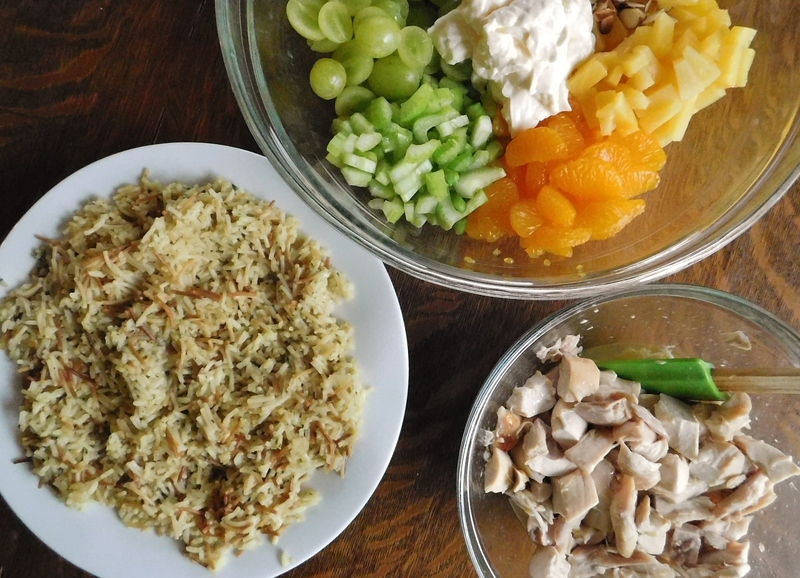 The hardest part of making this salad might be draining the four cans of fruit. Well, maybe it was harder to crush the cookies. Hmmm – I can’t decide. I guess I could have worked a little harder on crushing the cookies. Some pieces were a bit large, but nobody seemed to mind that. All mixed up and ready for the big show. 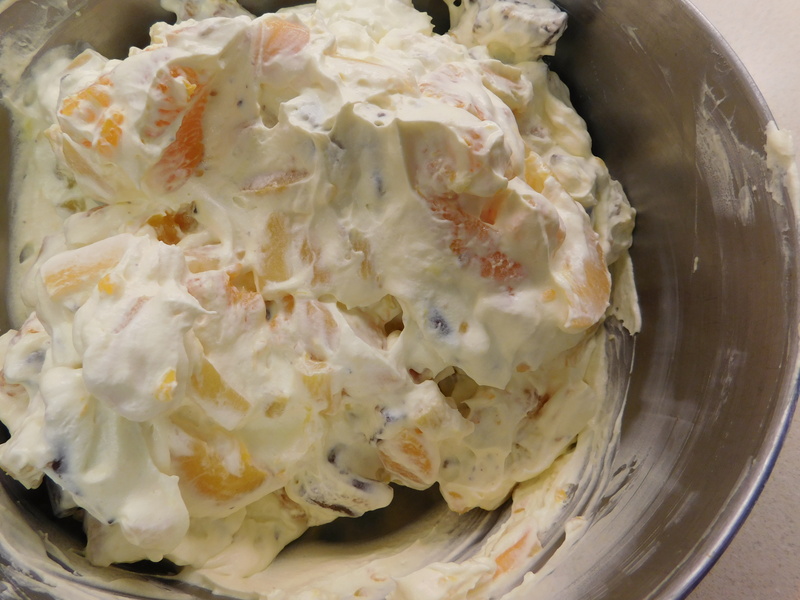 This just seems like something you’d want at a special occasion, but it’s so easy to make, it seems like it might not be special enough for a special occasion. Wrong. 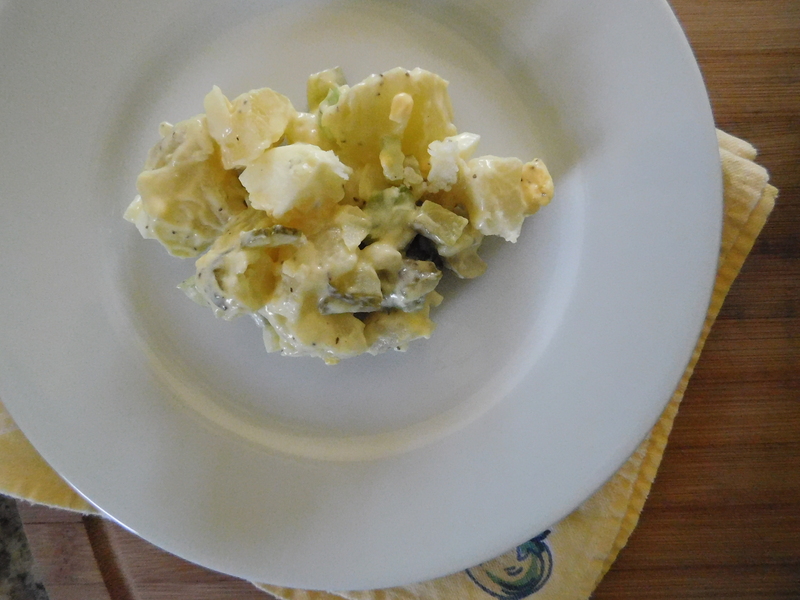 This is a very special salad and it’s PERFECT for a special occasion. You can see here on the top of this serving of salad that there were some pieces of cookie that were large and didn’t get crushed enough – oh well. I think Grandma and her sisters had the right idea. I like this kind of “salad” instead of the healthy kind. Well, maybe the healthy kind of salad has its place. This “salad” SHOULD be saved for special occasions, I guess. Very special. Happy summer, everyone! 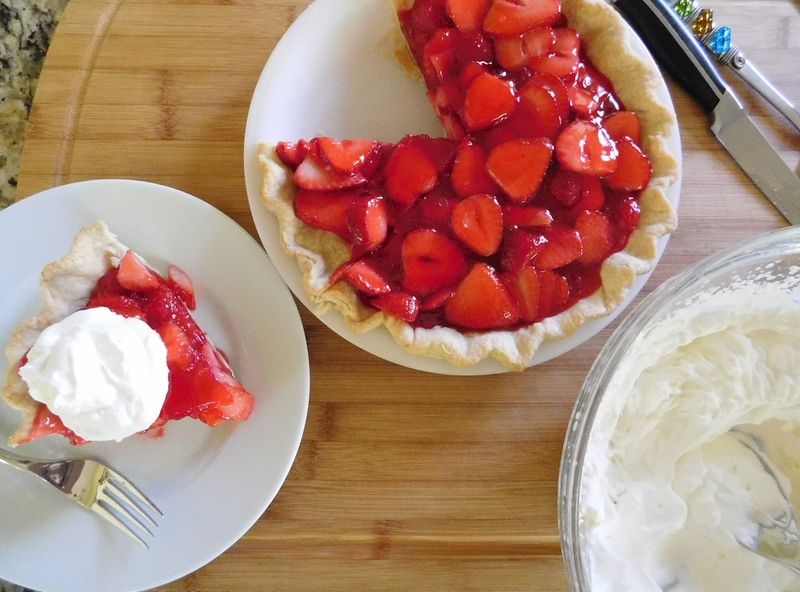 Summer is the time for strawberries and pie is one of the best ways to enjoy them. 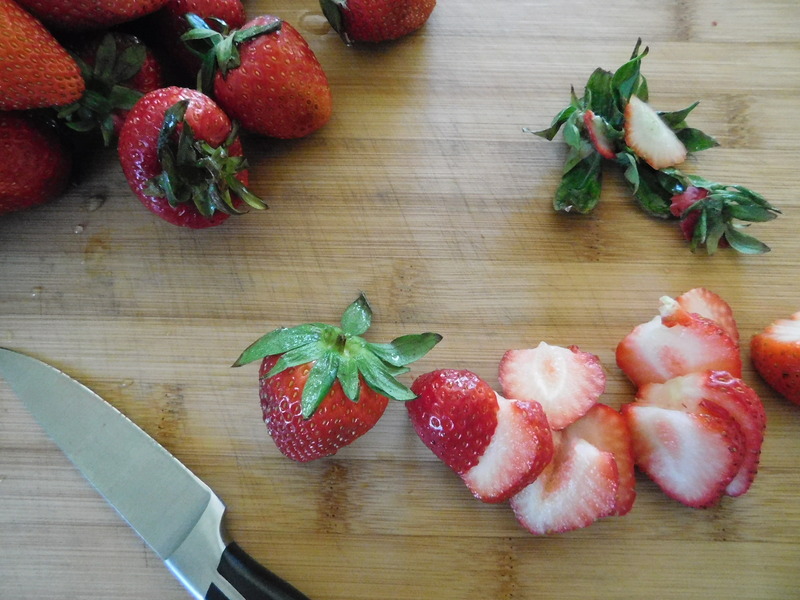 There just isn’t anything better than strawberries in the summertime. 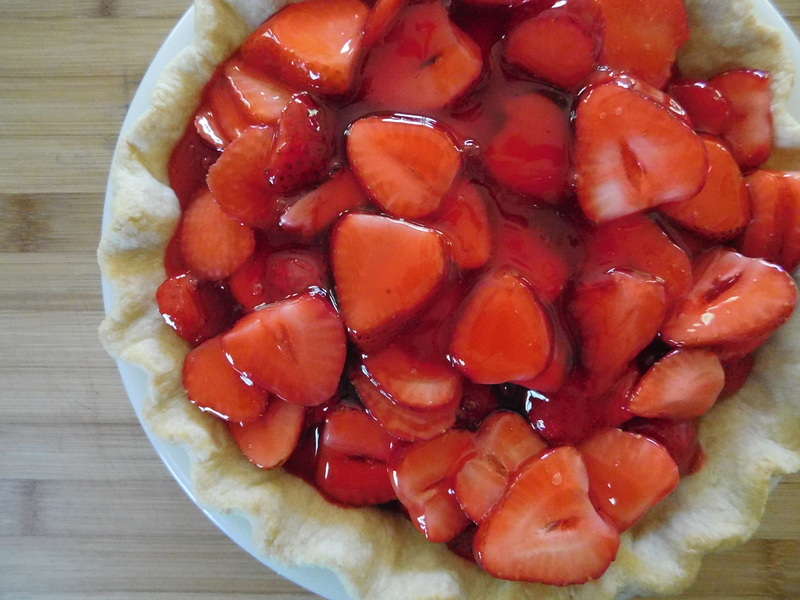 The recipe for today is #3 on the strawberry pie list, therefore it’s renamed Strawberry Pie #3. 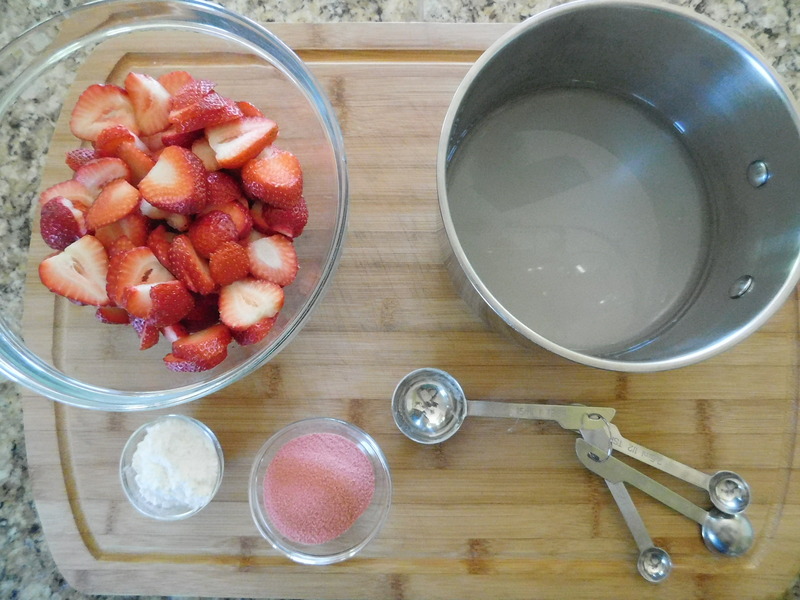 You get a bonus recipe because there are two recipes for Strawberry Pie here, but they’re so similar, I decided to just make one. Naturally, I made the one marked “V. Good”!!! Someone, I think it was me, started to write out the second recipe, and it looks like they were interrupted and my mom finished writing it out. Grandma had written on here that it was a recipe from my mom, so I guess it’s no surprise that she was the one who finished writing it out. I just love that these two recipes were written out on a piece of scrap paper! Grandma wasn’t one to waste anything – even bits of paper like the back of a mailer or flyer! Because it does have the “V. Good” connotation, we know that this will be a good one. This one is so easy and soooooooooo good! Pour into pre-baked pie shell (I used the recipe from my post Apple Pie with Old-Fashioned Pie Crust). 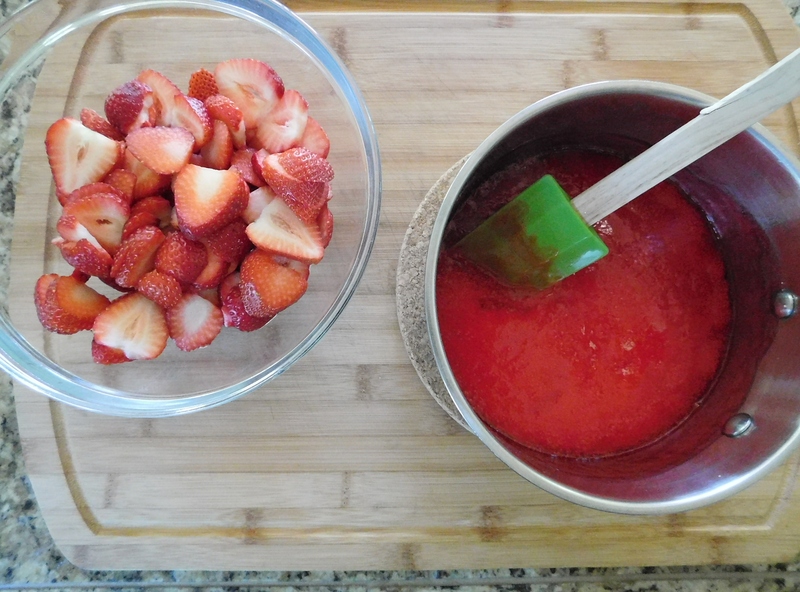 I just love strawberries! They’re so pretty and so tasty! This pie is really simple – not many ingredients. You can use a (gasp) store-bought pie crust for this, but I think you all know by now how I feel about that. Make the crust, for heaven’s sake. It’s not hard. It takes about 5 minutes to make. Just make sure that you do it early enough in the day to be able to chill it before baking so it holds its shape. The recipe I used for the crust makes a double, so I made two, blind baked them, and put one in the freezer for later. 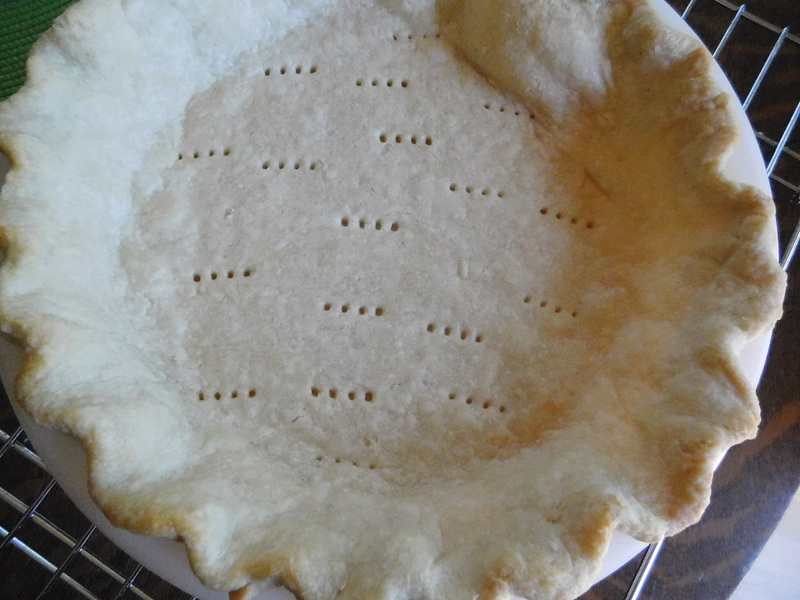 Here is how I blind bake pie crust – put the rolled out crust into a pie pan, dock the crust with a fork, line the unbaked crust with parchment or foil and then pour in pie weights or dried beans (I have the same ones I’ve used for 30 years), bake at 425 degrees for 12-15 minutes or so, remove the parchment or foil and pie weights and bake another 5-6 minutes, and let cool. You might as well make both of the crusts in the recipe because you’re going to need another one. 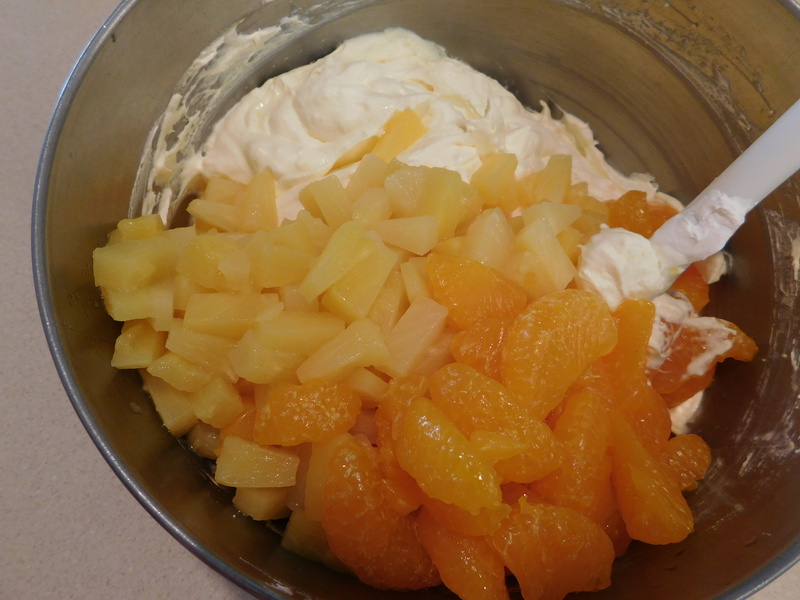 You’re going to make this pie again. Trust me. I love that there is almost more fruit than filling. Mix it up and into the crust it goes! This pie is absolutely beautiful!! Now into the frig with it! 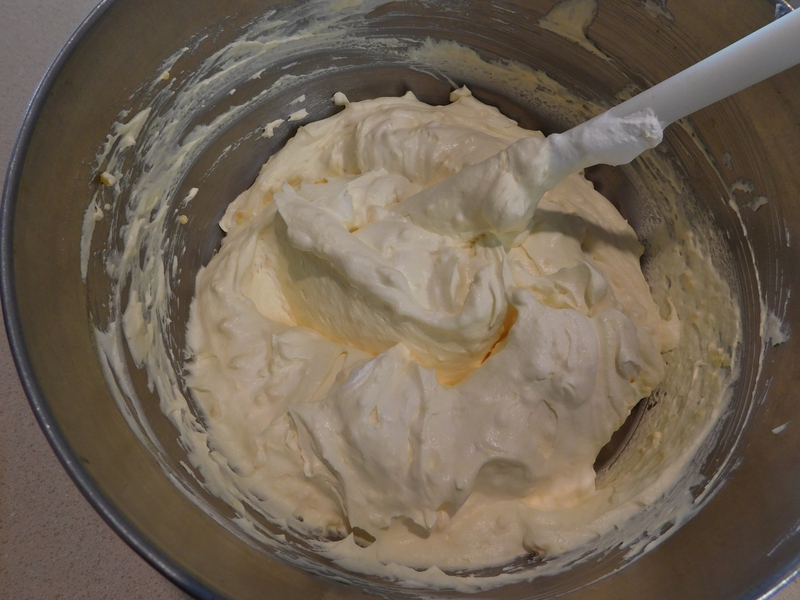 Add a dollop of whipped cream and it’s heaven. Pure heaven. 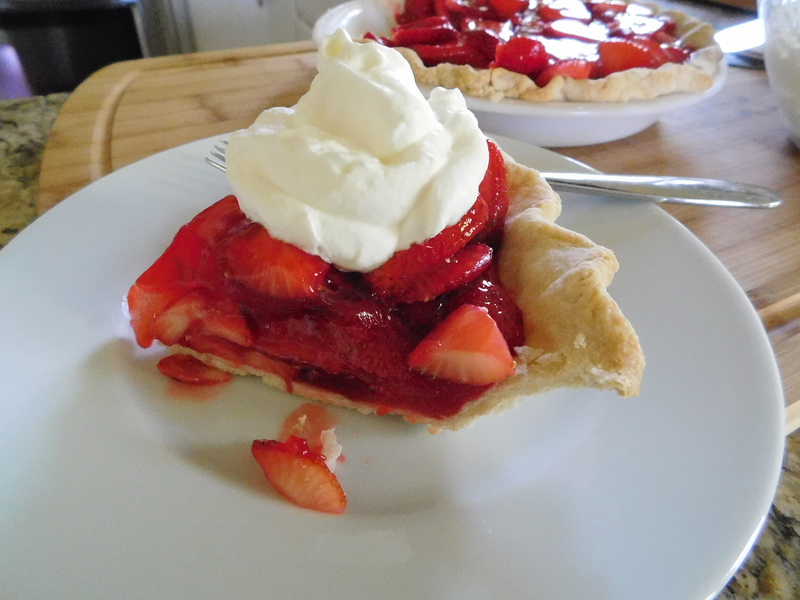 Strawberry Pie is not hard to make. 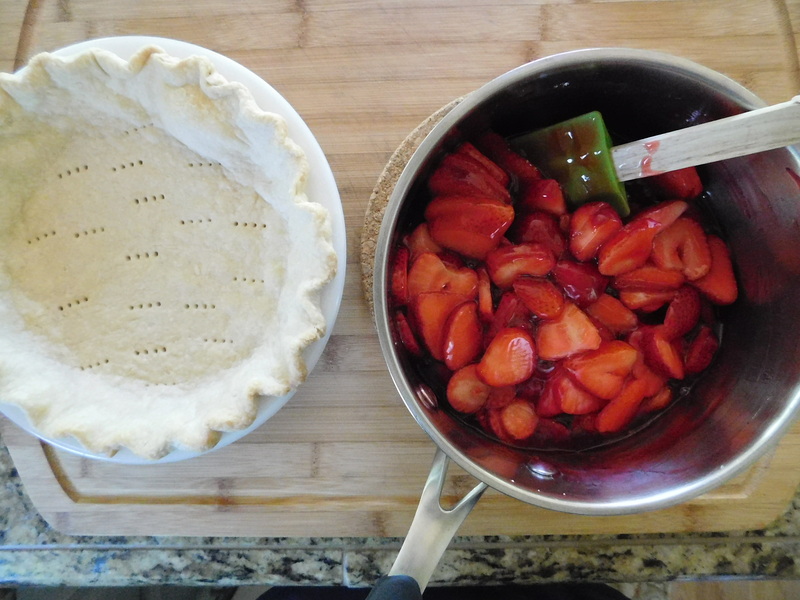 Just make one, and use local berries if you can, because you just can’t beat using those little jewels in this pie. It’s beautiful. It tastes like quintessential summer. It’s mandatory. It’s “V. Good”.